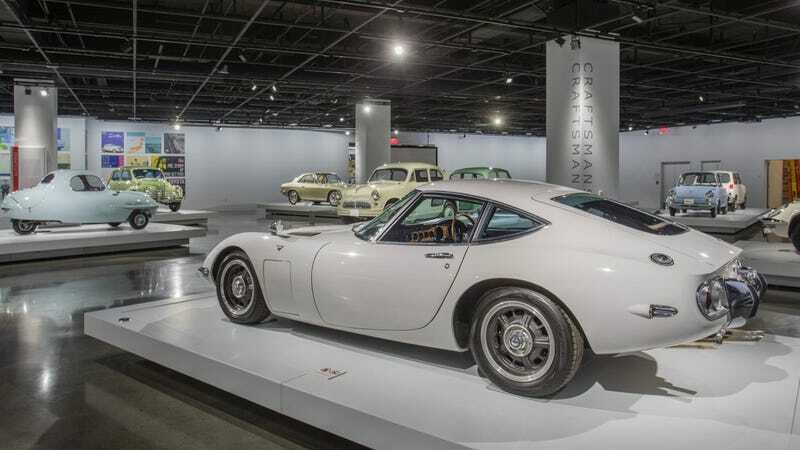 The Petersen Museum in Los Angeles has just opened an exhibit showcasing some of the prettiest and most interesting ancient Japanese cars I’ve ever seen. I’m not talking about modern classics you still see on the road–some cars in this collection date back to the 1940s and earlier. You might only see some of them once in your life. The exhibit, called “The Roots of Monozukuri: Creative Spirit in Japanese Automaking” is scheduled to run through April 2019, so if you can’t get to Los Angeles this weekend, don’t worry. Monozukuri, I learned, refers to “the art and science of making things.” What’s featured in the exhibit are cars themselves, fully assembled, not factory pieces or tools. But specific cars have been selected because they’re very cool examples of exceptional craftsmanship. Indeed, there are a few interesting tuner cars in an adjacent room: a MKIV Supra, an RX-7, a very old Skyline and a couple wacky race cars you might recognize if you came up reading Import Tuner and Sport Compact Car. But I thought the most radical vehicles of the show were the really primitive (and tiny) Japanese cars with their bicycle wheels and dainty controls. Oh yeah, there’s also a Mazda Cosmo and a Toyota 2000GT in the mix so make sure you bring your drool bib. The Petersen is also hosting a Porsche exhibit and still has some lowriders on display too, but both of those will probably cycle out before the end of the Monozukuri display. Regardless, the Petersen is always a good time and I would particularly recommend seeing this old imported iron while you have the chance. If you still haven’t had enough after walking around the above-ground levels at the museum, there are even more amazing cars to see on the a vault tour but you’ve got to set aside some time for that one. As if car enthusiasts needed another excuse to come to LA. But just in case you’re not going to be able to get here within the next 11 months or so, or if you just can’t wait to see the cars on display, here’s a huge stack of photos we got courtesy of the museum. Hope you weren’t in a hurry to scroll down and leave the comment. Or as we used to say–“56K stay away.” Enjoy!